New Riders of the Purple Sage @ Roy's Hall, Sep 17th! The New Jersey Highlands Coalition proudly presents the The New Riders of the Purple Sage in concert @ Roy's Hall, Saturday, September 17th at 8:30 PM. Enjoy a fun night of Rock and Roll Music while supporting clean water and a bright environmental future for NJ. ROY’s HALL is operated by Blairstown Live-Arts, Inc., a NJ non-profit cultural institution (501(c)(3) application pending) with the goal of promoting a broad appreciation of the interplay between culture and artistic expression. It does this by acting as a forum for artists who best exemplify world traditions, reflect contemporary trends and explore artistic frontiers, and by nurturing the artistic and cultural life of its own community in and around the Skylands region of New Jersey. Signed to Columbia Records by Clive Davis, NRPS released its eponymous first album in September 1971 to widespread acclaim. In the next 11 years the band toured and released over 12 albums, selling over 4 million records. 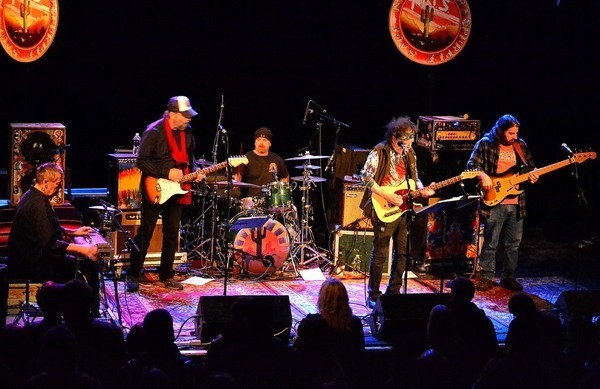 NRPS began as a part-time spin-off from the Grateful Dead when Jerry Garcia (pedal steel guitar), Phil Lesh (bass) and Mickey Hart (drums) teamed up with John Dawson (guitar, vocals) and David Nelson (guitar). Although early live appearances were viewed as an informal warm-up to the main attraction, the group quickly established an independent identity through the strength of Dawson’s original songs. By 1970 Dave Torbert had replaced Lesh, and Spencer Dryden, formerly of Jefferson Airplane, had joined as the group’s permanent drummer. Garcia remained in both The Dead and The New Riders until he found himself overcommitted, at which time Buddy Cage replaced him and the classic NRPS lineup was born. Original NRPS bass player Dave Torbert and drummer Spencer Dryden have passed away, co-founder John Dawson Passed away in 2009 due to ongoing health problems. His considerable talents will be missed but his songs and musical legacy will live on. Before he passed he had given his blessing and was excited to know his music is being heard live again by a whole new generation of fans. The new lineup vows to keep the NRPS spirit and tunes alive by taking them to fans everywhere. The band recently teamed up with Grateful Dead lyricist Robert Hunter and released it’s first CD in twenty years to rave reviews, “Where I Come From”.